Professor Paul Iversen and Classics Major Boaz Heller (’17) have been conducting an archaeological and epigraphical survey on site in Turkey over the past two weeks. This survey is part of the study abroad course, Landscape Archaeology and Epigraphy (CLSC 318/418), and is in partnership with the Isparta Archaeological Survey in Turkey. The picture of Boaz was taken at Sagalassos. Behind Boaz is the hill from which Alexander the Great is thought to have attacked the city in 333 B.C. 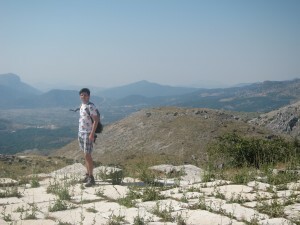 The picture was taken at Sagalassos. Behind Boaz is the hill from which Alexander the Great is thought to have attacked the city in 333 B.C.